They’re some of the most common questions in any finance interview. You can find reasonable guidelines for how to discuss an industry, but hardly anyone explains how to learn an industry in the first place. And what good is the perfect structure for your answer when you don’t have an answer? A lot of the conventional “wisdom” about this question is wrong and misleads students and professionals. First, these types of questions are among the most common ones in interviews. Second, in practice almost all buy-side firms have some industry focus. The biggest ones have industry teams, but the thousands of < 10 person firms out there tend to specialize. Boutique banks also tend to specialize, but in investment banking you’re more likely to join a large firm, where industry groups are the norm. Third, at the MBA level and beyond you need an industry specialization. Every MBA-level candidate I’ve interviewed has agreed on this point. Finally, this question will become even more important in the future. Due to the abundance of prep resources, “interview guides,” and other crap floating around, interviewers have shifted to case study and discussion-based questions. Most people will say something like, “Read a book! Read lots of articles! Read, read, read!” if you ask them how to learn an industry. And then they’ll recommend industry-specific publications such as the Oil & Gas Financial Journal, BioCentury, and so on. But it’s almost impossible to “learn” an industry solely from reading about it. Would you expect to learn another language solely from reading a grammar book? Or learn a musical instrument solely from reading sheet music? Those are both impossible to learn without practice. And the same goes for learning an industry. But you face a constraint that doesn’t exist with learning languages or music or sports: extreme time limits. So you can’t spend three years building financial models and valuations to learn an industry; you might have only three days to prepare for your interview. It’s not useful, or even feasible, to create full 3-statement projection models with supporting schedules just to learn an industry. Instead, focus solely on the revenue and expenses, and, more importantly, the justification for those revenue and expense figures. Coming up with these numbers will force you to do enough research to make them look credible; justifying them will make your reasons “stick” more easily. To demonstrate, I’m going to use examples from a new version of the Bank & Financial Institution Modeling course we’re working on. Just like the other new courses (Fundamentals, RE PE, Oil & Gas, etc. ), this one will be based on how you use modeling in real life to make investment recommendations. ANZ, one of the biggest banks in the Australia and New Zealand region. Searching for “[Industry Name] overview” often yields dry, academic texts that take forever to sift through. 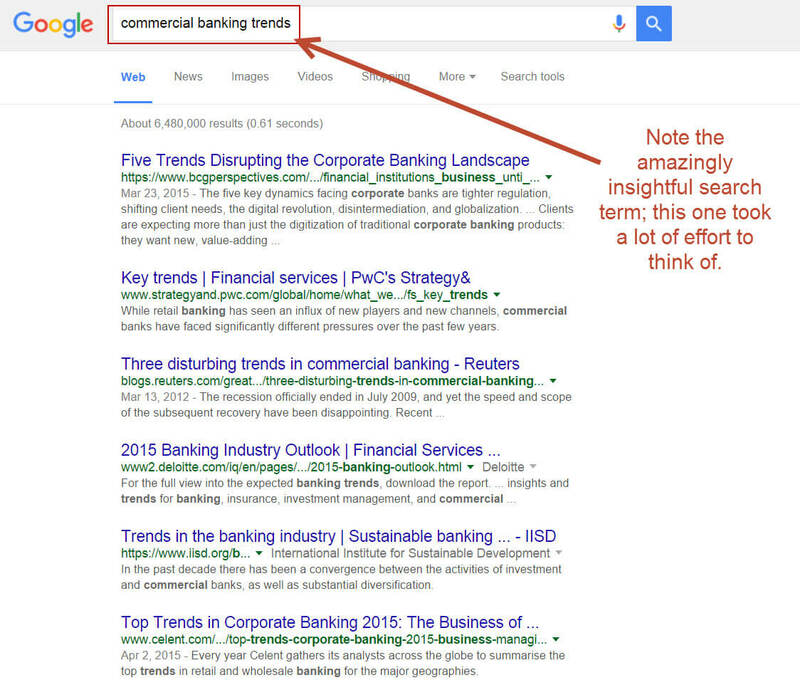 By contrast, searching for “[Industry Name] trends” will give you better results since the articles are shorter and since you’ll find what matters today. You should also review the industry overview articles we’ve published on M&I, since they tend to focus on “evergreen” factors that stay the same over time (e.g., valuation methodologies). You can find them all under “Industry Groups” on this page. And if you have even more time, sure, knock yourself out with equity research, industry primers from the banks, and more… but you probably don’t have time to read through hundreds of pages. Identify 2-3 major trends that you can speak to in interviews. Figure out what makes the industry tick: What influences customer spending? What about the expense profiles of different companies? What causes companies to enter or exit the market? Identify a small, non-diversified company that represents one of the 2-3 major trends you’ve identified. Trend #1: Big Banks are under increased pressure due to Basel III, CRD IV, Dodd-Frank, and other regulation that has introduced new capital and liquidity requirements; many firms will spin off divisions in response. Trend #2: Small-to-mid-sized businesses (SMBs) have not been able to borrow enough to fund growth and have been underserved by large banks, so smaller, independent firms (“challenger banks”) have been popping up to cater to them. Trend #3: Traditional banks, faced with low interest rates, have been expanding beyond the traditional loan/deposit business model into areas like wealth management. The key industry drivers are covered in the article on Financial Institutions Groups (FIG): for commercial banks, loan and deposit growth, the interest rate spread, fee income from other business segments, headcount/technology expenses, and regulatory capital. Dividends are incredibly important, the Dividend Discount Model is used in place of the traditional DCF, and P / BV and P / E and related multiples are the most common ones. 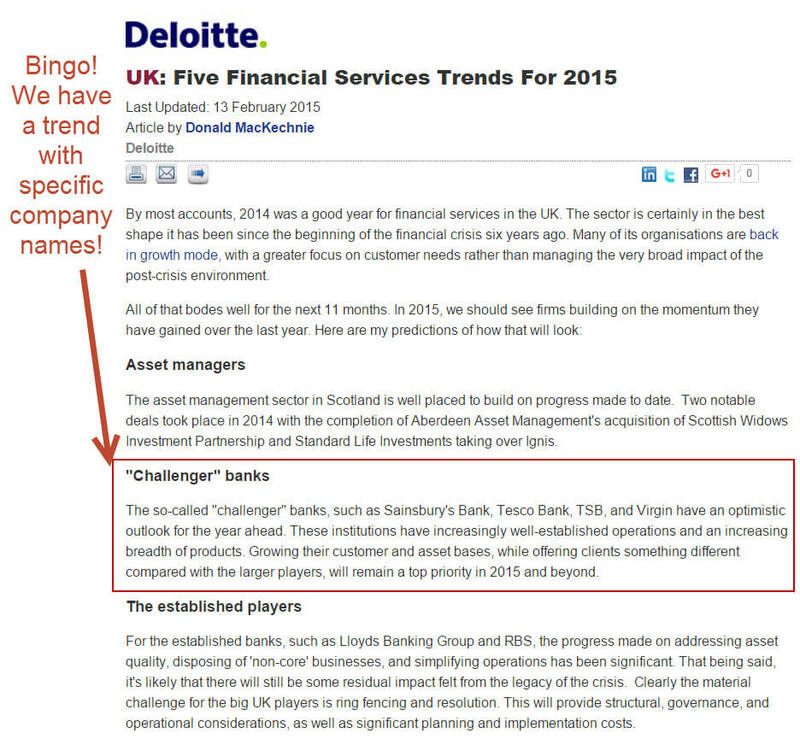 We picked Shawbrook as an example of a smaller company that represents one of the key trends above: challenger banks springing up to meet unfulfilled lending needs. The most important question is simple: what drives a bank’s loan and deposit growth? Both loans and deposits tend to move in-line with the overall economy. As GDP increases, lending needs also increase because businesses need to borrow more to grow, and consumers and businesses have more cash to deposit. But it also comes down to the bank’s market share: even if the overall economy is growing briskly, the bank may not be benefiting if it’s losing ground to rivals or new competitors. 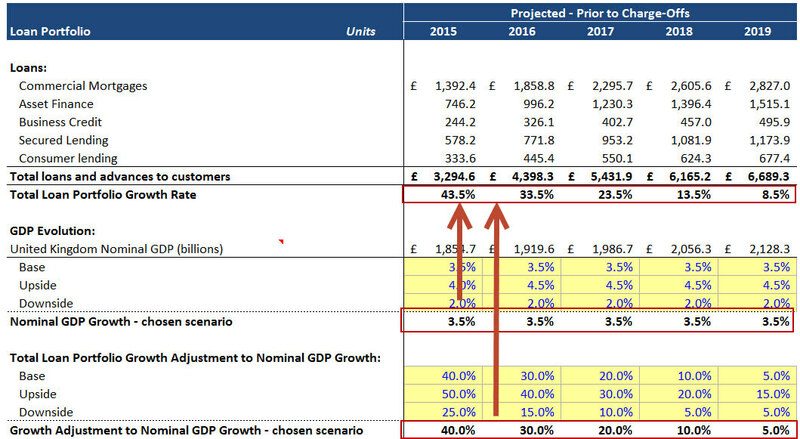 So the overall logic is that the UK GDP will likely grow at between 2% and 4% per year over the next five years, based on historical numbers and economic forecasts, and the company’s loan portfolio will grow at some percentage relative to that. In a pessimistic scenario, the UK GDP will grow by around 2% per year and the bank’s loan growth will decline from 70-100% down to 10-20% or less. In the base scenario, GDP growth will be around 3.5% with loan portfolio growth falling from 40-50% to ~10% over five years. To come up with these figures, you need to find estimates for drivers like the UK GDP growth rate, and also look at how quickly peer banks are growing. Similar logic applies to the interest spread: you have to look at historical numbers and future expectations. Interest rates have been at all-time historical lows, which hurts banks because it’s harder to charge a high spread when overall rates are low. But they may increase by 1-2% in the future, assuming someone kills all the central bankers some sanity returns, which is what we’ve reflected here. We don’t have the time or space to cover expenses here, but you would use similar logic and guesstimate the interest expense, the bank’s required headcount, and the costs of technology/rent/other items. You do not have to be “correct” about any of these numbers. Loan/Deposit Growth: Linked to GDP and to the bank’s market share/historical loan growth relative to GDP; we think a decline from 70-100% growth to 10-20% by the end of five years is likely based on 3.5% GDP growth and a slowdown in SMB lending as more and more needs are fulfilled. Interest Rates: The company is unlikely to expand significantly beyond traditional lending in the near-term; we think interest rates will stay near-zero because higher rates may wreck the economy. That, in turn, limits spreads and net interest income. Overall, the company will continue to grow its loans and deposits far above the rates of larger banks, but that growth will slow down more rapidly than expected. Once you’ve sketched out the smaller company’s revenue and expenses and the justifications for your thinking, you can move to the larger firm. You can find this larger firm in the same background reading or even by looking for the largest companies in Industry X in Region or Country Y – this Wikipedia page is a good example for commercial banking. The process is similar for a larger bank like ANZ, because once again you have to justify items like the loan/deposit growth and interest rate spread. So you would think about the key drivers for each one and sketch out projections here as well. For example, if you assume that “fee and commission income” mostly comes from wealth management, it’s driven by the fee percentages the bank charges clients, and the total amount of assets the bank is managing. The fee percentage is unlikely to change by a huge amount, so the customer count and the average assets per customer will be the key drivers there. Maybe you review peer banks in Asia-Pac, and you believe that ANZ will grow its assets and customers at a faster clip because of its recent expansion efforts there. Or maybe you decide that ANZ can’t compete effectively with local banks in China and Singapore because it doesn’t have the same direct access to clients there, so you expect it to grow at a slower rate. The point is not to get “the right answer” – the point is to come up with numbers and then justify them based on industry trends. Tell me about Industry X.
What’s a recent trend in Industry X? What company in Industry X do you think is interesting? To answer these questions, you could use a “composite” of your mini-modeling exercises and the outside reading. Industry Overview: “The commercial banking sector is split up into larger, diversified banks and then smaller firms that focus on specific areas, such as lending to different industries or customer types. All commercial banks make some amount of money from the interest rate spread on loans and deposits, but the larger, diversified ones also operate in areas like wealth management, investment banking, insurance, and more. Due to a combination of increased scrutiny from governments, regulations such as Basel III and CRD IV, and low interest rates, banks have been expanding outside of their traditional businesses and going into fee-based areas. Recent Trend: See the last two paragraphs of the industry above. You could also speak about some of the trends affecting ANZ, such as growth in the Asia-Pacific region and how nearby banks are trying to capture that growth. Interesting Company: “One interesting company is Shawbrook, a UK-based ‘challenger bank’ that offers loans to small and mid-sized businesses that are unable to borrow from the traditional high street banks. It went public in April, and it has grown its loans by over 70% in the past year, now serving over 60,000 UK-based customers across £2.3 billion of loans. 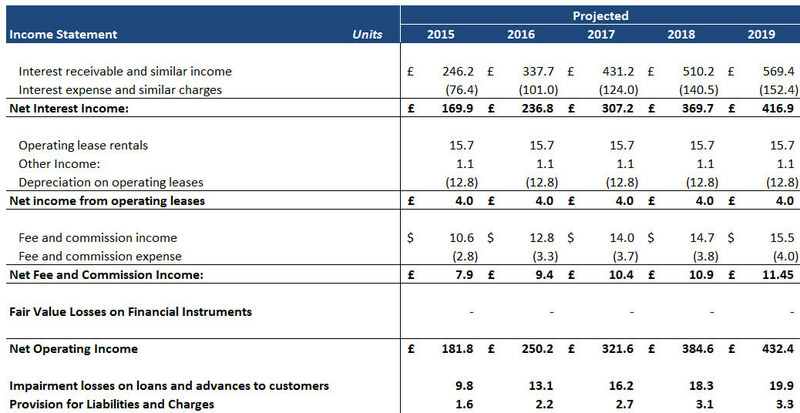 Its Net Operating Income was around £112 million, and it had Net Income of £35 million in the most recent fiscal year. It’s part of a new wave of smaller, independent banks focused on underserved areas of the market; other examples include Virgin Money, TSB, OneSavings Bank, and Aldermore. Where are you getting that 10-15% growth rate from? Why do you think the SMB market will become saturated? How do those other banks compare? If you’ve written down your justifications for the figures you quoted, you should have no trouble answering these questions. The point is not to memorize responses to everything, but to gain so much practice with an industry that you can discuss any topic. …might be one of the most important and most misunderstood interview questions. And that’s a big problem if you’re at the MBA level, if you’re aiming for buy-side roles, or if you’re applying to smaller, industry-specific firms. You can structure your answer easily, but you also have to learn the industry in the first place so you can discuss a broad range of topics. 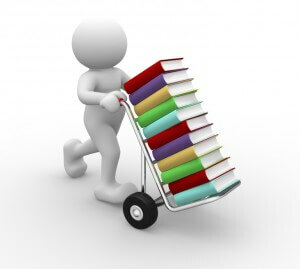 You can’t do that just by reading – you have to do a certain amount as well. The best type of “doing” is to look at a smaller, simpler company and come up with simple figures for its revenue and expenses, and then to do the same for a bigger, more diversified company. And then test yourself by outlining answers to the most common interview questions, using those two companies in your responses. Do all that, and you might just find yourself giving the interviewer a few tips about the industry. Can You Tell Me About a Recent Deal? And many of the public companies are going to the public in the recent one or two years. How to figure out the “trend” with only 1 – 2 years financial statements? We replied to your questions via the BIWS help desk and the ticket you submitted there. All of those together have around 150 hours of video, so if you can spend 3-4 hours per day on it, you’re probably looking at around 2 months to finish everything (allowing extra time to complete the exercises and read through the case study prompts). If you only have 1-2 hours per day, it might be more like 3-4 months. Yeah, that is a good point. If you have the time it definitely helps to speak with people in the industry – the issue is that sometimes it’s tough to do that if you have only 2-3 days to learn an industry since people take their time responding to you. And I agree it’s more helpful to do that in emerging and frontier markets where there aren’t as many resources and research sources. Thanks! We are going to cover an equity research report in the new Bank Modeling course and will try to do a shorter version as well. One more thing I realized that ‘learning by doing with 2 or 3 days left’ issue varies from person to person because many students while pretty good academically are not so good with excel (to slow, do not know anything about using shortcuts), do not have the first clue about building a financial model, so it takes them at-least a week to understand the basics of building a model, at-least with the students I have come across. I have even personally met someone who had cleared the CFA Level 2 but did not know how to build a model and I have also heard of several similar cases, some had even cleared level 3 (i know the CFA does not teach modelling but someone doing/wanting to do the CFA must at-least search options for learning practical work since the CFA is ideally for someone who is already working or aims to work in AM or ER or other similar areas in finance maybe Treasury Management) even many MBAs in my country do not know how to use excel. This has partly to do with a very closed mindset that does not explore the possibility of learning beyond the books in the first place and partly because business schools in my country do not really encourage learning how to model for a particular job, even though there are one or two excel courses. Schools do hold additional workshops for general financial modelling (for which students must pay since the workshop is held by some firm or individual) but modelling courses specifically for a job/industry are not there. So, would 2 or 3 days be enough to ‘learn by doing’ (even if it is building a basic model not necessarily industry specific) for such individuals? If someone really doesn’t know how to use Excel, no, 2-3 days may not be enough for the person. But honestly, your chances of winning internships or job offers without basic Excel knowledge are almost 0 these days anyway. Traditional university classes tend to be useless for finance roles, which is why most people learn Excel through online courses such as our own, or via books, or other sources. If you already have some basic familiarity with Excel, I think 2-3 days is enough to at least have an intelligent discussion about an industry even if you don’t know every detail. Thanks! If you take a look at the Overview lessons in each industry-specific course, we cover the key drivers and main differences there. There are also some PDFs that go out in the various emails you receive that have short guides to each industry.